There are in excess of twenty different species of lavender plants. The standard variety is immediately recognisable by its grey green needle like leaves and spikes of mauve flowers, although there are other varieties with leaves, and pink, purple or white flowers. For lavender to be grown successfully they need a sunny spot with well drained soil. Depending on the variety chosen they can grow between 12" to 36" tall. They can be started from seed but are easier to grow from cuttings, which you can purchase or do yourself. Ensure you allocate sufficient space for the variety you have chosen ,and if you are planting more than one space them out accordingly. Lavender should be pruned once the flowers have faded but make sure you don't cut back into the old wood. You will find that after several seasons they tend to become leggy and so will probably need replacing every five years or so. Lavender plants have an unforgetable aroma and are used mainly in pot pourri or as a dried flower in muslin bags. In the kitchen the flowers can be used to flavor jams, sweets, vinegar and are often crystalized for decoration. The flower sprigs are also used as a fly repellant. Many people swear by lavender tea to treat headaches, anxiety and a range of other minor aliments. The essential oil produced from Lavender is also regarded as an effective antiseptic and can be applied to treat burns and insect bites. Attracting wildlife into the garden is something we can all do in our own small way, and the lavender plant is a great way of attracting bees and butterflies which are so important for the fertilization of flowers and fruits. A wonderful plant to have in the Butterfly Garden. It is estimated that there are over four thousand different species of bees many of which can benefit from the introduction of plants into the garden. If you have ever observed bees you will see that they love to move from flower to flower in a small area, so if you can plant your lavender shrubs close together. The English Lavender Munstead is one of the Lavandula angustifolias or English lavenders. It is a fragrant sturdy lavender that is great as a hedge. This variety flowers profusely in the springtime, after which a good pruning will provide a beautiful gray bush with highly aromatic leaves. 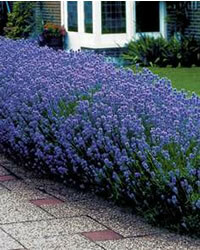 This is a compact variety of English lavender producing blue flowers. It is just the thing for landscaping gardens. The flowers have a rich sweet flavor and are particularly good when used with sweets. The flowers may be used in baking and added to tea. It is advisable to eat only the flower petals, simply pull the flowers from the small brown or green cap that they're attached to. Lavender Grosso, Lavandula x intermedia 'Grosso', has attractive blue-green evergreen foliage with hundreds of large purple flower spikes which create an amazing display from mid to late summer. This long-stemmed beauty has the darkest blue-purple flower spikes of any of the French hybrid types. It's also by far the most cold hardy and incredibly fragrant , particularly after rain. The calyxes cling tightly to the flowering stems when dried, making ‘Grosso’ an excellent choice as an everlasting dried flower or for use in lavender crafts. 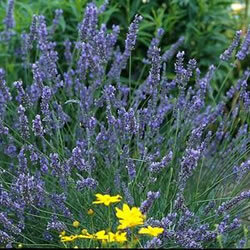 As with all Lavender it prefers full sun and loose, light, well drained soil. It should not be over fertilized, particularly if you have over-rich soil as it will result in the plant being less fragrant. Planting should be carried out in early spring, as soon as the soil is workable, or in late fall. This compact lavender is renowned for its impressive and distinct fuchsia like red blooms.